Is it snowing in Radstadt/Altenmarkt ?Thank you! Radstadt/Altenmarkt, in Austria, is a medium sized ski resort with 9 ski lifts (4 chair lifts, 5 surface lifts) that offers skiers an impressive 844 metres (2770 feet) of vertical descent. 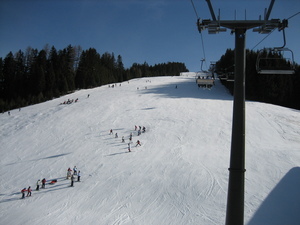 Radstadt/Altenmarkt has 19 pistes. Radstadt/Altenmarkt is best suited to beginner skiers and snowboarders but there is some terrain for intermediates but little of interest for expert skiers. There are 160 kilometers (100 miles) of cross country ski trails at Radstadt/Altenmarkt. For snowboarders, there is a terrain park. The majority of the pistes at Radstadt/Altenmarkt are covered by snowmaking. Pequeña estacion que dispone de dos telecabinas y dos telesillas, con algunos telesquis, estos para uso de escuelas, que con 17 klm de pistas parece que tienen alguno mas. Ideal para dias con malas condiciones por poca visibilidad o nevadas, ya que las pistas van por entre los pinos. Hay variedad de recorridos y se hace muy gratificante el esqui en estas estaciones.